I'm off to Edinburgh tomorrow for the Yarn Festival, which is hugely exciting - I mean, 3 1/2 hours of train knitting! That is not to be sniffed at and my bag of on-the-train projects has been packed for days. Oh come on, surely I'm not the only one to pack their knitting before their clothes? 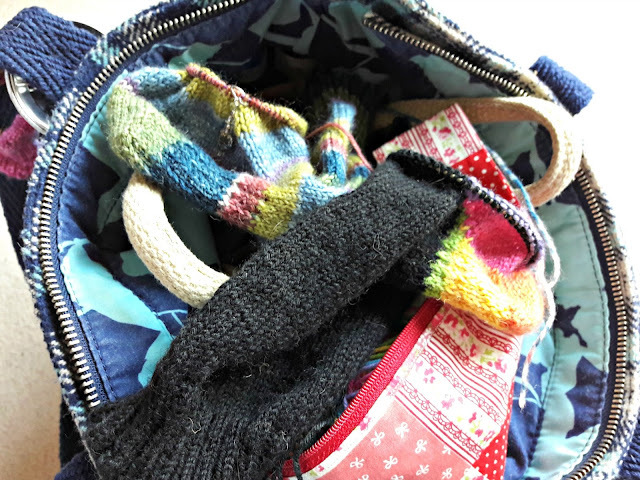 In this bag I have a pair of Stylecraft socks (the stripy ones at the top) which have been on the needles for what feels like forever (a situation which was not helped at all by cinema knitting). The colourway is Everest, if anyone wants to know, and I'm just past the gusset of the second sock so there's a very good chance that those socks will be finished before we reach Scotland as long as I don't try to knit with my eyes shut and we don't go through too many long tunnels. The other sock, that black one with the coloured heel (that's WYS Rum Paradise, the most exciting thing about this sock), has been on the needles for even longer. I love my husband very much but I do wish that he didn't only ever want to wear black socks for work. This is the first sock of the pair and I could really do with cracking on with it; I'm starting to feel a little guilty that he hasn't had a new pair of work socks since last year. Some of his original pairs are years old now and although they're still wearing well, I do feel the need to replenish his sock supply with new pairs. The good thing about knitting with black yarn is that I don't need to knit in the dark to drop stitches, so I'm keeping the cinema knitting technique going J.
I'm also taking my Hartland Cliffs shawl which I showed you last week, and my Arwen socks which I finished just in time for the end of the Blacker Pod KAL - there's a showing off session on both days of the festival which I'm looking forward to as I've seen so many fabulous projects on social media during this knitalong and it'll be nice to see them in real life, and also for those who wear their finished items, a discount off more Blacker Yarns yarn. So, I've used up some of my stash and my reward is ... to buy more stash! Only a knitter could think there is any kind of logic in that! 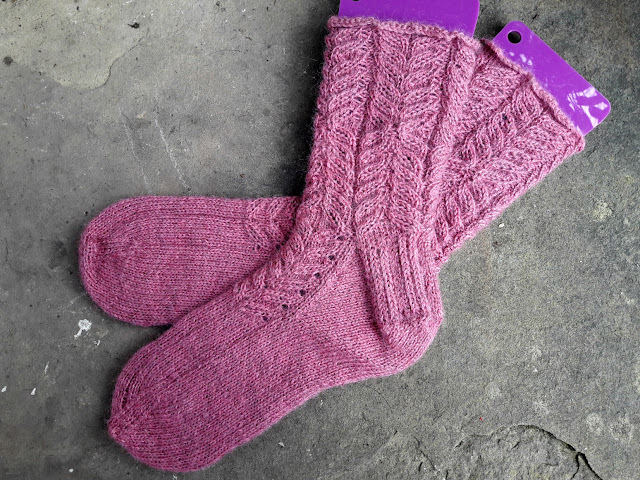 I really enjoyed knitting these socks, the Tamar yarn I used is gorgeous and just slips around the needles. I'm hoping that they wear as well as they knitted up. These will be the third pair of no-nylon socks I've knitted (the first were the Peru socks, then the Easy Cable Socks) so I'll need to get myself sorted out to create a new page for no-nylon reviews once I've worn them for a bit and can tell you how they stand up to being on feet on a regular basis! 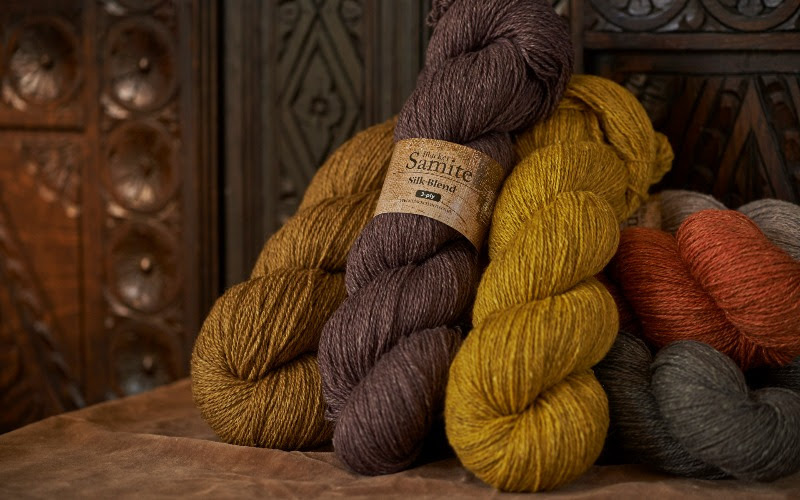 Blacker Yarns are previewing a brand new yarn at the festival called Samite. I've got a bit of preview information but I haven't had my hands on any of it to squish yet, although Sonja from Blacker Yarns has promised me a sample so I'll be able to tell you a bit more about it when I get home. It sounds like a very sumptuous yarn combining Ahimsa silk, Blue-faced Leicester, Shetland and Gotland wool, and it's woollen spun to reduce pilling and make it as suitable for colourwork and cables as for lace projects. Although at a heavy 3ply weight I don't think it's going to be a suitable yarn for socks, it does sound as if it would be wonderful to wrap yourself up in for a shawl. I'll keep you posted! I haven't been to the Edinburgh Yarn Festival before and from the emails that I've been getting through the mailing list, and also listening to the build-up on the KnitBritish podcast, it sounds like it's going to be an exciting weekend. I'm not going to get to the pre-festival meet ups or the ceilidh but I don't think that will spoil the visit - there's certainly enough to see in this very lovely Scottish city! There are lots of exhibitors that I've not seen (or sometimes heard of) before and it'll be good to see their stands and what's around from Scotland and the islands. I don't really need more yarn but I know that I won't come back empty-handed so I'll show you my treats next week! I haven't been to Edinburgh for years and I'm really looking forward to visiting the city again - I'm keeping my fingers crossed the weather holds out so that I can do a bit of sightseeing as well as yarn squishing! I'm also very excited to be meeting up with relatives whom I have not seen for far too long; it should be a good weekend all round! Oh, and did I mention that there's going to be 3 1/2 hours of train knitting? That's each way! Before I go, and not at all related to packing, have you seen that it's the time of year again to put forward nominations for the British Knitting and Crochet Awards? After the success of including crochet as a separate category last year, the awards have been renamed to reflect that which I think is a great idea. I also think it's a brilliant opportunity to shout up for the people that have helped to shape our crafting over the last year, especially smaller and independent designers and companies who might not normally get much of a look-in around the bigger companies. I loved how many "independents" were nominated last year - including me, so thank you if you nominated me! If you want to get involved in the nominations, you can find the page here (or you can click the picture) and there's also the chance to win a hamper of yarn and related treats worth £200 or Amazon vouchers worth £100. Right then. I suppose I'd better go and find a few clothes to wear over the weekend now that I've got my yarny priorities sorted out. Have a great time if you're travelling to the festival yourself, and if not then I hope you still have a wonderful weekend! How exciting to be going to a yarn festival and spending time with family. Can't wait to see your purchases I also pack my current project, lately, socks, first and worry about other items such as clothes, toothbrush second before a train journey. I regularly travel to Melbourne to stay with my best friend who just happens to be my sister in law. The trip is also 3 1/2 hours, perfect time to sit, relax, enjoy the scenery and knit to my hearts content with no interruptions. I also take a small thermos of coffee so I don't need to go to the diner. Well, obviously craft projects are packed first! You have to think about what would be most suitable to do at certain times, how large the project is (don't want to have to cram it in! ), then you need a selection of projects in case you fancy a change and finally there are the UFOs that we promise ourselves we will complete during the trip! It takes far longer to sort all of that than to throw a few clothes into a suitcase.